Per traditions, Jon-Paul Kaiser is ready to launch a surprise drop TODAY! This year he took on Medicom’s V.A.G series! Check out all the take on the various silhouettes. 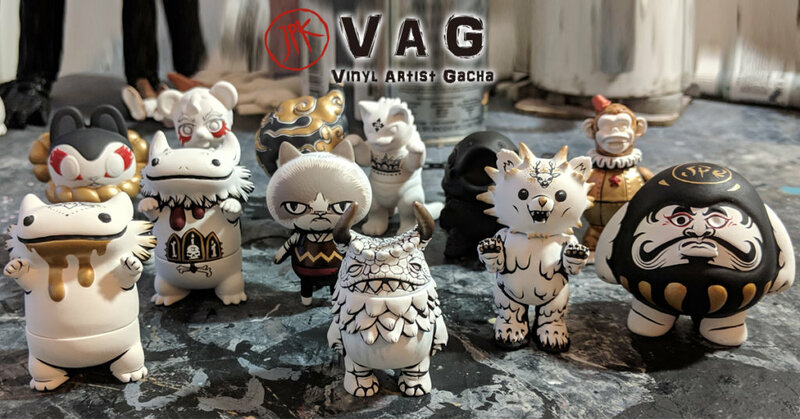 Ranging from Anraku Ansaku’s Raccoon Pokopon, Cherri Polly’s Zodiac Cats, DAN’s Chibi Pogola, KIKKAKE TOY’s Iron Ape, Shoko Nakazawa’s Baby Byron, Noriya Takeyama’s Koibose, Teresa Chiba’s Inuharigon, Hariken’s DARUMABOYA and MORE! All in JPK’s signature style. Below are a few work in progress shots.